The Racing Steps Foundation-backed driver put himself in a great position earlier in the day having qualified on the front row of the grid alongside ART Grand Prix’s pole sitter and championship leader Charles Leclerc. Dennis was forced to defend his position when the lights went out, outbraking his Arden International team-mate Jack Aitken into the opening corner and holding on to second place. With Leclerc remaining ahead, Dennis opted to make his move for the lead on lap five, again outbraking his rival into turn one up the inside which Leclerc did little to defend, and quickly pulled out a one-second lead by the end of the lap. Dennis continued to lead by the halfway mark ahead of Aitken who disposed of Leclerc. After managing his tyres, Dennis pulled clear of an under pressure Aitken, setting personal best times and stretching his lead in the final laps to almost two seconds, before taking the chequered flag to score his first GP3 Series win and first at the Italian circuit. Dennis stood atop an all-British podium with Aitken second and DAMS’ Jake Hughes taking third place. 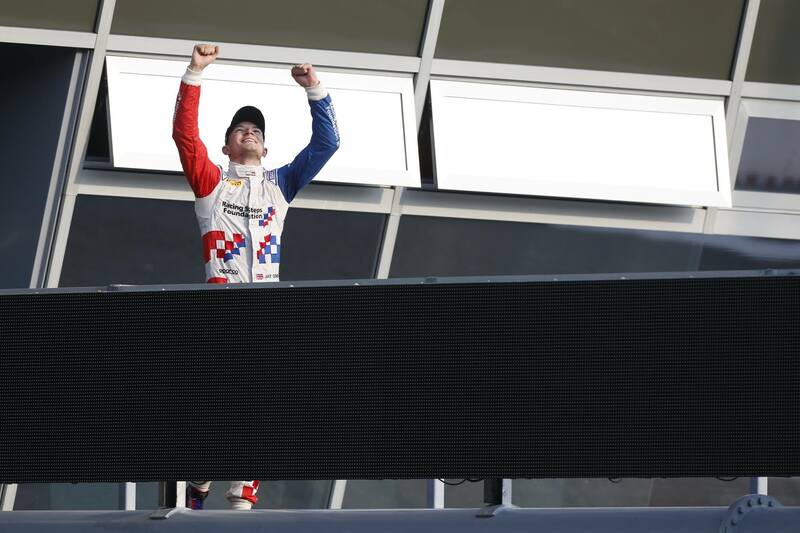 “I’m delighted with my first win at Monza and in GP3,” Dennis said. “I’ve had some podiums here before, but to get the win is fantastic. “I knew that having new tyres after saving them in practice, I had the advantage at the start over Leclerc and so it proved. I had the tow out of the Parabolica and I think he was looking more at his championship position. He left me just enough room, I braked later and pulled a big gap. “The move on Charles had to be done. I noticed from the start of the race that I had lots of understeer and wasn’t helped by being behind him. Once I was in the lead, the balance came back. “I pushed away from Charles for two laps to break the tow. Tyre degredation wasn’t as bad as at Spa at the last round. I had to use 95 per cent of my ability and it was an intense race when Jack was right behind me. I couldn’t relax and I had to push again. “It wasn’t a normal Pirelli race of just running around once at the front. The tow at Monza is so big that you have to watch your mirrors.